Preferred Hotel in Great Barrington, MassachusettsSituated in the heart of the gorgeous Southern Berkshire Mountains, Great Barrington is surrounded by natural beauty. 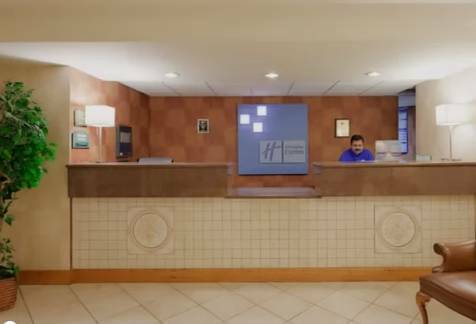 For work or pleasure, the Holiday Inn Express Great Barrington hotel offers the perfect home-base for your trip to Western Massachusetts.An abundance of artistic, cultural and recreational opportunities await you. Our hotel's surrounded by the area's best attractions, such as the natural-terrain motorpark, Lime Rock Park. In winter, ski at nearby Butternut Basin, and in summer enjoy numerous performances at the Tanglewood Music Festival. We're also close to Shakespeare & Company, the Norman Rockwell Museum, Hotchkiss School, Berkshire School, Salisbury School and Chesterwood.With top companies such as Sheffield Plastics, Becton and Dickinson, Schweitzer Mauduit, Specialty Minerals & Berkshire Corporation nearby, it's no wonder business travelers prefer our Great Barrington hotel. If you need to host a meeting, we have a small conference room that can accommodate up to 25 people, free Wi-Fi access and a Business Center make staying productive a breeze.In Great Barrington, MA, our hotel's property features some of the best amenities. Enjoy a refreshing swim in the indoor pool or relax in the hot tub. Before heading out in the morning, grab a cinnamon roll and cup of coffee at the free, hot Express Start Breakfast Bar. "Stay Smart" on your next trip to the Berkshires! Naji's Mediterranean Cuisine: Old world Mediterranean and Lebanese dining. Falafel and Kabob with the "Best chili ever" Catering and delivery available. Beer and wine, eat in or take out. Dine inside or on the patio. A Staff favorite. Try the award winning baklava! The East: Chinese and Japanese Restaurant. Very good value. Large Sushi and Sashimi menu. Four Brothers Pizza: Pizza, Pasta and Salads. Desserts too! Barrington Brewery, The Well, Bogies: A few bars around town. None on site. Price ChopperThe Golub Corporation exists to help people feed and care for themselves and their families. We are an innovative retailer of products and services, and recognize that consistently satisfying our customers is key to our success.